3X Industrial cartridges are used to neutralize organic based odours associated with damage from sewage, water, mould, trauma and body fluids. For use with the portable and effective Restorator dispensing system. When placed in the Restorator, the patented essential oil filled membranes release a non-toxic, odor-neutralizing dry vapour into the air to effectively treat up to 20,000 cubic feet. This pairing technology emits a penetrating vapour that quickly controls and eliminates organic based malodours from sewage, water, mould or body fluids trapped in the air, building structure and contents, so the odour does not return. The 3X Industrial cartridge is effective for 270 hours and is intended for applications where quick results are desired. 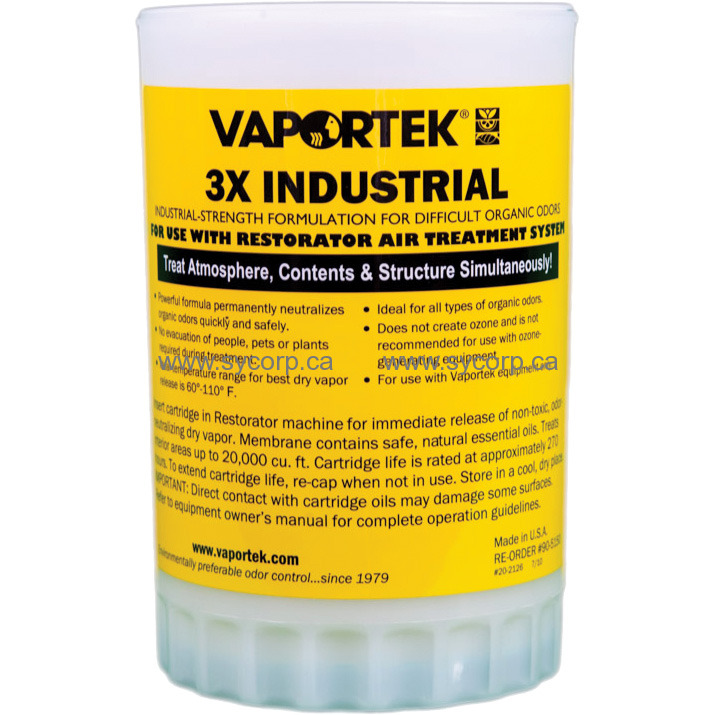 No ozone, no PPE, no evacuation or recovery period is necessary with Vaportek technology. Not recommended to use in classroom with all doors and windows shut over long period of time (months) as the children don't get to breathe any fresh air with the machine running 24 hours. Not recommended to use if a person has asthma.